I did some research about a year ago on the differences between MP3 and MP4, and most of the research seemed to say MP4 was better. Lately though, I am thinking elsewise. I'm wondering if anyone can suggest if I should use MP3 or MP4 for backing up my music collection. I've started backing up about 20 of my current collection as 256kbps M4A, but I've recently read that MP3 sounds better at higher bitrates, and MP4 sounds better at lower bitrates. When to use MP3 or MP4? Video formats can be quite confusing but pretty simple once you read the following comparison between MP3 and MP4. MP3, acronym for MPEG-1 Audio Layer 3 designed by Moving Picture Experts Group, is an audio coding format that adopts lossy data compression. MP3 is widely used for audio streaming or storage. The amount of data required for audio recording is largely reduced due to MP3 compression technology. MP4, acronym for MPEG-4 Part 14 designed by Moving Pictures Experts Group, is a digital multimedia format that is widely used for both audio and video storage. It handles text and images as well. MP4 video files take up a lot of space. MP4 compression techniques are more complex. 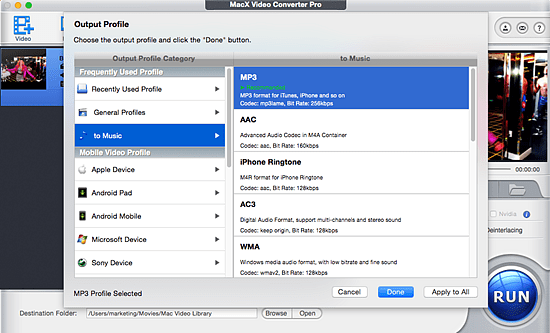 MacX Video Converter Pro - enables you to free download video music (MP4/MP3) from YouTube, Facebook, Vimeo, Dailymotion, etc. 300+ video sites and convert video to iPhone iPad Android MP4 MOV MKV AVI FLV MP3 AAC etc. 83X faster. MP3 has lower file size and not fixed compression ratio, which means that you can balance between file size and audio quality. It is also more compatible, works with almost all music players. Moreover, the legal status in some countries remains unclear. However, low audio quality is MP3's biggest disadvantage. As I mentioned before, MP3 handles only audio. While MP4, a newer file format, deals with audio, video, image and text, which differs significantly from MP3. MP4 is a file format used to compress files losslessly, producing better audio quality. Videos in MP4 format can be played on a large array of multimedia players and portable devices. And MP4 is used for various purpose, like streaming videos even audios, encoding videos. It seems that MP4 is better than MP3. But why the popularity of the MP3 format has not abated because of the wide usage of MP4 format? As a matter of fact, although being often used as the alternative to MP3 format on Apple devices, iTunes, MP4 is not a replacement of MP3 on players and in computer as an audio format. When to use MP3 or MP4 depends on what you are using them for. If you prefer listening to music on MP3 player and smaller file size, use MP3. If you care more about lossless audio quality, MP4 is your ideal format. I guess you have got general ideas about these two totally different formats from the comparison between MP3 and MP4. Now you may wonder what you should do if you get MP4 format, but what you really want is MP3 format. All you need to do is to convert MP4 to MP3, that is it! Below is a comprehensive guide. There is a well received MP4 to MP3 conversion software, MacX Video Converter Pro, which can deal with converting MP4 to MP3 no sweat with no quality lost in a fast speed. Better still, this powerful video converter is capable of converting among almost all video formats with over 14 audio and 180 video formats supported, say, MP4 to AVI, MKV to MP4, MOV to MP3, on Mac for playback on multimedia player or the latest portable devices like iPhone 6/6 Plus, iPad Air 3/Mini 3 thanks to its over 350 preset profiles for Apple and Android devices. Moreover, this advanced MP4 to MP3 best video converter for Mac features downloading and converting YouTube videos for offline playback on portable devices. MacX Video Converter Pro is a full-featured, high quality, and incredibly fast video converter. It is capable of easily converting various video formats to be compatible with portable devices at fast speed.